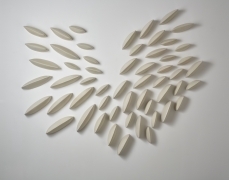 Maren Kloppmann is a ceramic artist renown for her architectonic wall sculptures. Both her large and small-scale installations are a study in the reconciliation of the divergent qualities of natural and man-made structures by creating a visual dialog between the two aesthetic aspects. Kloppman was born in Germany in 1962 and raised in Veerssen. In 1981, Kloppmann undertook a three-year apprenticeship at Keramik Handwerkskammer for production pottery. Upon receiving her Journeyman degree in 1984, Kloppmann travelled to the United States to pursue a yearlong studio assistantship in Iowa City, and completed several artist-in-residencies in North Carolina and Michigan. She later received her undergraduate degree at the Kansas City Art Institute in 1993, and her master's degree at the University of Minnesota in 1996. After a 17-year career in functional ceramics, Kloppmann began experimenting with volume and proportion. Taking inspiration from both her urbane working environment, and the austere simplicity of her studio and wooden treadle, Kloppmann describes her style as the "visual confluence between control and serendipity," and it is obvious that each of her sculptures, handcrafted from soft clay slabs, embody a balance between precision in design and the subtlety of the artist's touch. 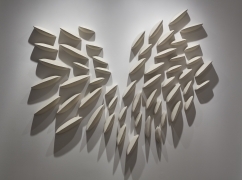 Kloppmann creates sculptural wall installations and porcelain vessels, employing a combination of techniques that include throwing, slab building and coiling, with an apparent focus on the three dimensional space that the pieces occupy. 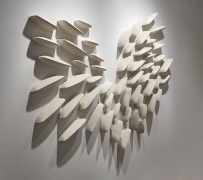 Her objective developed from utilitarianism into the artistic reconstitution of space, which she achieves through the creation of porcelain sculpture in shapes of definitive relief, depth, texture and color. 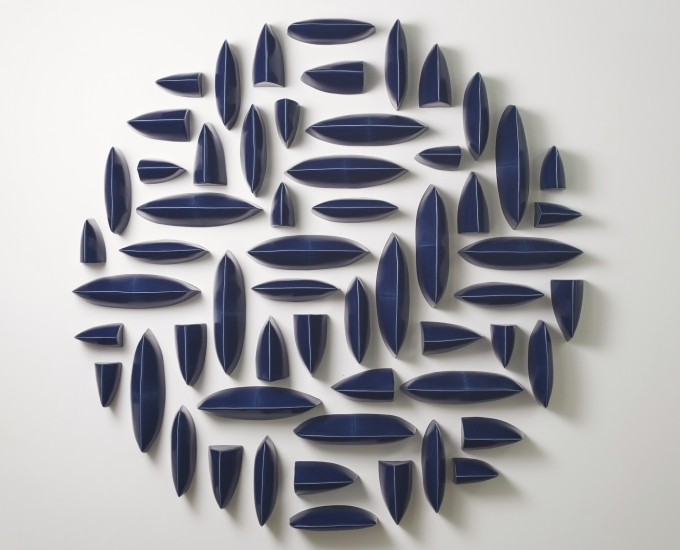 She also pursues specific means of presentation, such as wall mounting, in which her sculptures appear to manipulate sources of light. This is ultimately how Kloppmann's Shadow Wall Pillow series was conceived. 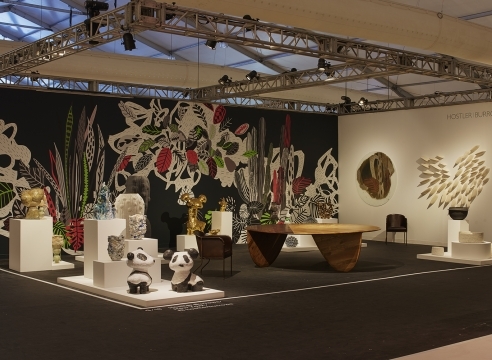 The resulting artworks are stable, contained shapes, often in modular repetition. The juxtaposition of colored glazes creates soft tensions and unique geometries. 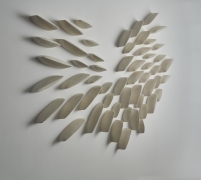 Her works can appear at once organic and architectural; they are minimalist studies in the precision of line, volume and form that blur the boundaries between craft design and fine art. Maren Kloppman currently lives and works in Minneapolis, Minnesota, where she operates her own studio and gallery. She is a three-time McKnight Fellow, and her awards include a Jerome Fellowship and five Minnesota State Arts Board grants. Her work is represented in numerous museums including the Crocker Museum of Art, Sacramento CA, the Frederik R.Weisman Art Museum, Minneapolis MN, the Herberger Museumof Art & Design, Tempe AZ, the Historical Society of Minnesota, St. Paul MN, the Minneapolis Institute of Arts, Minneapolis MN, the Nelson-Atkins Museum of Art, Kansas City MO and the Tweed Museum of Art, Duluth MN.